Since Dr. Dayan Jayatilleka ( DJ ) has retorted to my reply, in Daily Mirror 19th Oct, let me also respond to certain facts he brought to justify his “ stand” and challenge my views. His answer to “Tamil Discrimination” was “1958 Emergency” and “Black July ’83”. These were incidents instigated by hooligan/separatist Tamils which flared in to so called “communal” riots. In 1958 the Tamil rabble rousers applied tar on the “Shri” mark in vehicle number plates and Sinhalese name boards. In 1983 13 Sri Lankan soldiers returning home for leave were massacred. Both times the actions resulted in retaliatory actions. Sinhalese general public are not to be blamed. They were carried out by thugs associated to politicians and some of the culprits arrested were Muslims! Hundreds of Sinhalese were also brutally murdered in Jaffna in retaliation. Why doesn’t DJ speak about these Sinhalese killed by Tamils? As per his logic then Sinhalese have to be victims of discrimination too. I expected a better answer from DJ than this superficial one. Referring to my question on Tamil Grievances, DJ advises me to brush up my reading and refer to LLRC. Yes I did. When President Rajapakse appointed the LLRC, after few days, UNSG violated the UN Charter and appointed the Darusman Committee (POE) displaying lack of confidence in the LLRC. The POE report was published before the LLRC Report and in it LLRC was criticized as being BIASED. LLRC report categorically declares Sri Lankan troops did not commit war crimes but present UNHRC Head Zeid Al Hussein refutes this. LLRC never spoke of IHL being applied to the ‘conflict’ but Lord Naseby addressing the House of Lords declared that only international humanitarian law should apply and nothing else. So what is the credibility of the LLRC that DJ quotes! All that I asked was ‘what are the grievances of the Tamils’ and without answering DJ wants me to refer to the diagnosis and the prescription given in LLRC. Even the world’s best consultant can give a wrong diagnosis and wrong prescription! That’s why “concerned” people always go for a second opinion! When asked, if autonomy is given to North, what about the aspirations of the 52% Tamils living in South, DJ says, question of autonomy/self rule is rooted in a geographical area, where they form a compact mass majority and not defined by the percentage of people of that ethnicity who live outside that area. So as per DJ’s understanding there is nothing wrong in Tamils, who form a majority in Wellawatta, Mt. Lavinia, Dehiwala and Bambalapitiya, asking for self rule in those areas too!. DJ should be reminded that there were more than 50,000 Sinhalese and Muslims who lived in Jaffna prior to 1983. If I were a paid consultant to the separatists with same ideology, I would have advised LTTE to commit “ethnic cleansing” and rid both Sinhalese and Muslims from that “geographical area” as an initial step for “autonomy”. In actual fact, that was exactly what had happened and that’s how self rule/autonomy/13A for Tamils based on majority theory is justified! DJ’s response to my post-war examples are that they are wars between/against countries and not from civil conflicts. He then compares the war against LTTE with JVP insurrection. Now I must say that DJ should brush up his reading on armed conflicts. What we had in our country was a Non International Armed Conflict (NIAC) as mentioned even in Darusman and OISL reports. The LTTE was a non-state actor because they had uniformed cadres, good Command and Control hierarchy, a conventional army with air and sea wings, capability to carry out continuous attacks, administered a defined area. Additionally, it had material support & funding from overseas. The government signed the Cease Fire Agreement “recognizing” LTTE as a party to conflict and a defined territory! DJ’s comparison of NIAC with a bunch of insurgents who fought with Gal katas is hilarious if not stupid. In NIAC the applicable law is IHL which is also applied to International Armed Conflicts too. 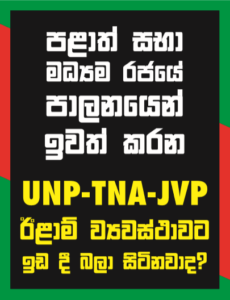 DJ at least now must accept that allowing JVP to continue after the insurrection and allowing TNA, the proxy of LTTE to continue after the war, were two different scenarios. DJ is either deliberately or through sheer ignorance, trying to mislead the public in referring to two joint communiqués on May 21st and 29th 2009, (with India and UNSG ) as including a COMMITMENT to implement the 13th Amendment. I challenge DJ to show any public document where the President had “committed” to implement 13 A. MR did not express his firm COMMITMENT to proceed with 13 A but his FIRM RESOLVE. The word “commitment” connotes a certain finality and irrevocability but “firm resolve” allows a degree of flexibility. When one commits one is bound to it, but when one “firmly resolve”, one might, under dire enough circumstances, waver. What if minority parties use 13A to harbor hopes for a separate state? What if their party objectives or party resolutions also reserve this right? DJ would know too well given that he was a member of a party that declared universal declaration of independence! TNA and ITAK by Resolution have affirmed commitment to Vaddukoddai Resolution in 2008 – ultimate goal being Eelam. Can DJ justify devolving powers under 13A to areas where political parties foster separatist sentiments? If MR wavered to commit to 13A fully, we want to know who was pushing him to do so & why? DJ claims that by 2014 MR had lost international support including India at UNHRC. The reality is India had to succumb to US pressure but she condemned the resolution 25/1 while Pakistan said it was a clear example of double standards and hypocrisy. When resolution 25/1 was passed (23 in favour, 12 against, 12 abstentions) Why was resolution 30/1 passed without a vote?, is it because if a vote was taken countries would have voted for Sri Lanka or abstained? The principle is what matters! Even if you lose on principle, you win. DJ says “even R Sambanthan and Sumandiran who are not separatists, have moved on and talk about the “right of self-determination” of Tamil people”. Here I would like to quote late Mr. SL Gunasekera (his book “Where angels fear to tread”). “ …in any event no set of people who did not enjoy a right to “personal self-determination” could even dream of enjoying a right to “political self- determination”. The LTTE on its own admission, has denied to the Tamil people living under its jackboot any semblance of a right to personal self- determination. The claims of the lackeys of LTTE such as TNA about the Tamils having been deprived of the right to self- determination are, therefore, as wholly hypocritical as they are nonsensical.” I rest my point! Finally, DJ says the only viable political solution to the Tamil Question is the implementation of the 13A. DJ is yet to explain what the question is, except quote from various sources and extracting from Ballantine books dictionaries in Random House, New York! DJ was the Minister of Planning and Youth Affairs in North East PC under the Chief Minister Vartharaja Perumal who declared Independence for Elam and ran away to India. DJ being a political science expert should know, as I have explained above, granting devolution to political parties with separatist agenda is suicidal. If DJ insists on implementing 13A as a solution to ‘unknown Tamil Question & Grievances’, let him first persuade the TNA to reject the Vadukkodai Resolution in toto , for us to at least “consider” it.